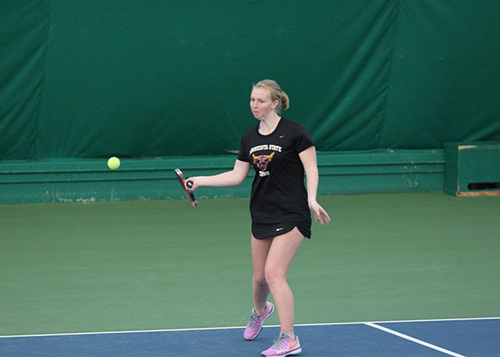 The Minnesota State Maverick tennis team split two duals on the road this past weekend. Saturday, the Purple and Gold took on St. Cloud State University but fell 6-3. However, the Mavs bounced back Sunday afternoon when they defeated the University of Minnesota, Duluth 7-2. Both duals were played in Duluth. The Mavericks struggled in the doubles matches early on against the SCSU Huskies. St. Cloud took two out of the three doubles matches with MNSU’s junior Melissa Mashburn and freshman Erin Streeter defeated the Huskies’ Marilia Roque Diversi and Abigail Kantor 8-6. Next came the single matches against the Huskies, where the Mavericks also struggled to take the lead. Out of the six single matches, the Purple and Gold were only able to capture two victories. Streeter won her match 7-6 and 6-2 and MNSU sophomore Killian Doran came back to win her match 0-6, 6-3, 1-0 (10-6). Sunday the Mavericks were looking to bounce back against the UMD Bulldogs. They completed the day with a 7-2 win. Mashburn and Streeter succeeded for the second time over the weekend, winning their doubles match against Drew DeCorsey and Kelsey Zetah 8-4. Then, Doran and Maverick senior Sarah McCann recorded an 8-3 win over Shelby Benkofske and Jillian Klasen. The Mavericks also won five out of six of the singles matches against the Bulldogs. Streeter dominated a 6-0, 6-0 win over DeCorsey, Doran posted a 6-0, 6-1 win, McCann won 6-2, 6-4 and sophomore Lisa Dobbleaere tallied a 6-1, 6-0 win. The last singles match victory of the day went to junior Abby Schmidt, who fought hard to win 6-3, 3-6, 1-0 (10-8) over UMD’s Rachel Menke. This season there are several Mavericks playing fantastic tennis. Doran has a winning singles-match record of 10-5, as does Streeter. Schmidt and McCann are both 4-9, while Dobbleaere holds a steady 6-9 record. For doubles, McCann and Streeter are 1-1, Dobbleaere and Doran are 1-1, Doran and McCann are 3-8, Mashburn and Streeter are 9-4 and Dobbleaere and Schmidt are 3-6. At home, the Mavericks hold a 3-2 record. Home games are played in St. Peter, Minnesota. On the road, MNSU is just 1-2 and on neutral sites the Mavs hold a 3-4 record. Major wins for the Purple and Gold include a dominant performance over Southwest Minnesota State 8-1, a 5-4 crucial dual against Sioux Falls, 9-0 against Winona State and a 5-4 victory over the University of Mary. With the weekend split, the Mavericks fall to a 7-8 record overall and 5-4 in NSIC play. Up next for the Purple and Gold is Bemidji State University, Saturday, April 9 in Owatonna, Minnesota. The dual will begin at 8:00 a.m.